The following lectures were presented at a lunch symposium at the 2016 BMT Tandem Meetings in Honolulu, Hawaii on February 20, 2016. More than 70,000 hematopoietic cell transplants (HCT) are performed each year worldwide, most frequently to treat patients with certain cancers of the blood and bone marrow, or to address genetic diseases. Due to chemotherapy and the immune suppression associated with HCT, patients are highly susceptible to viral, bacterial and fungal infections. These complications are a significant cause of morbidity and mortality in the months following the transplant, and too often the high risk of infection in the first year after transplant results in patients and their families deciding to not undergo a potentially curative transplant. Cytomegalovirus (CMV) is a member of the herpes virus family and remains a significant cause of viral infections in transplant recipients. A majority of adults in the U.S. have evidence of a prior infection with CMV, which establishes a dormant or latent infection that cannot be cleared; most individuals have an immune system that is able to prevent CMV from reactivating and causing disease. In individuals with weakened immune systems such as transplant recipients CMV commonly reactivates during the first weeks following the transplant, leading to infection of the lungs or other organ system and increasing the risk of other viral, bacterial and fungal infections. No therapies are approved for the prevention of CMV in HCT recipients because of known toxicities associated with available CMV antivirals, including bone marrow suppression and renal impairment. 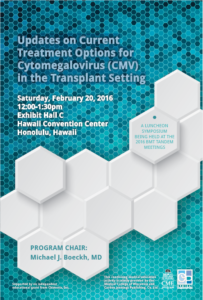 The goal of this educational program is to equip transplant specialists, oncologists, hematologists, and other healthcare professionals involved in the treatment of hematologic malignancies with the up to date clinical knowledge and tools they need to best treat their patients with the cytomegalovirus (CMV).